Another Sunday, another wonderful stroll around our wonderful city. 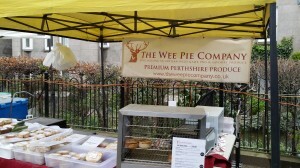 As is often the case, I stopped off at Stockbridge Market to see what was new. I’d stopped off a few weeks previously at the Wee Pie Company’s stall, tried one of their veggie pies and made a note to come back for another visit to sample something meaty before reaching a verdict. With a diverse array of pie fillings, including a #veginburgh friendly three veggie options, the stall has a popular following with an appreciative queue of punters on both of my visits. 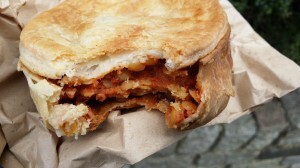 On the first visit I tried their “Lentil Med” (£3.50) pie, which brought together red lentils, feta and cheddar. The pie casing was expertly made but the filling was a little under-seasoned. A little more feta in the mix would have addressed this and given things a better melty texture, too. Much the same can be said for the meaty one I chose on today’s visit, the “Wee Black” (£3.50), which brought together venison roasted in red wine atop black pudding. 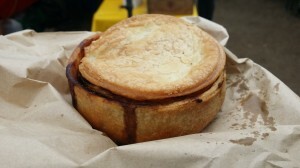 Again the pie casing was delicious, but seasoning was too light and there needed to be more moisture. So overall, while I was very taken with the Wee Pie Company’s pastry work, their fillings need a little refining to improve matters. With some minor seasoning tweaks, the fillings will match the quality of the casings as their source ingredients and flavour combinations are of high quality.